Raven Flight definitely suffers from the dreaded "middle book syndrome." I know that this series can be riveting; I felt it when I read Shadowfell, and I felt it when I got to the last 5% of this book. But, everything leading up to the ending, with the exception of one pretty intense scene, can mostly be described by the word "meh." You see, I had two major problems with Raven Flight - one being Neryn, and the other being the pacing. These problems are somewhat intertwined, as Neryn just isn't a strong enough character with exciting enough adventures to carry this book on her own. So, we're stuck with Neryn for most of the book, for better or worse, and I'd have to say that it's mostly for the worse. Whereas Flint is a deep and complex character that I want to spend my time with, Neryn is just vanilla - that is, when she's not frustrating the heck out of me. For example, Neryn's constant angst over killing the enemy really bothered me. Not that I expected her to be a cold-blooded killer or anything, but she joined the rebellion, for lord's sake. Rebellion means war, which means death - so, it's okay for the deaths to occur, as long as it isn't her specifically causing said deaths? That seems pretty hypocritical to me. Then, when she did have to kill people out of necessity, men who would have raped and killed her and Tali, mind you, she anguishes over it. I added a prayer for the men who had died or been forever changed here. They had performed their own act of violence. But, like the Enforcers who had fallen in last autumn’s battle, they had been sons, fathers, brothers, husbands. Someone would mourn their loss; someone had loved them. They were would-be rapists and murderers; geez, forgive me if I'm not busting out my tiny violin. If Marillier wanted me to empathize with Neryn here, she should have made the men she killed less horrific at least. Especially when compared to Flint's burden of having to kill men who trust and believe in him, Neryn's angst just seems petulant in comparison. As I said above, I was also left wanting by the pacing of this book. Marillier's writing is often slow-paced, with her beautiful prose and wonderful story-telling being able to carry her sagas on their own merits. 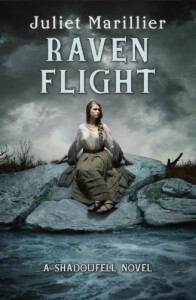 But, Raven Flight seemed especially slow, with really not much happening for the majority of the book, and without a strong over-arching story to really pull the reader through these moments. The ending to the book was jaw-dropping and intense, and there was one scene involving Flint's "Enthralling" that had me on the edge of my seat, but I wish more of the book could have been filled with that kind of energy. With that said, I'm not scared off of the Shadowfell series for good, because I have faith in Marillier and faith in this series. I just hope that the next book shows major improvements from this one.